Kamakura is one of the more popular day trips to take when in Tokyo. It’s a seaside area full of historical sights and is pretty easily accessible from the city by train. The way that I’ve gone is by taking the Shonan-Shinjuku line from Shinjuku station to Fujisawa station, then transferring to the local, 2-car Enoden train that stops at all the local sights in town. One of Kamakura’s main attractions is Tsurugaoka Hachiman-gū, a Shinto shrine that sits atop a hillside on some fairly large grounds. It’s centrally located near Kamakura station and is the area’s main attraction, in fact the area’s main boulevard leads right up to the entrance. From there, a long pathway that sometimes is lined with food and game stands - the type that you’d find at Japanese summer festivals - leads up to a courtyard area before a long stairway up to the shrine itself. I first visited the shrine for hatsumode, or the first shrine trip of the year, which is a ritual for Japanese people. It was just after New Year’s Day and I ended up joining hundreds of others who had the same idea. While the wait wasn’t as bad as I thought it’d be, the crowd was pretty sizable like it is at most major shrines during this time of year. We lined up with everyone else in the courtyard area at the bottom of the stairway, and waited for about half an hour before ushers guided us up. Just outside the shrine grounds is Komachi Street, a small side street that runs parallel on the west side of the main road leading up to the shrine. It’s a local, walking street full of small shops selling Japanese food and treats, including some amazing matcha ice cream (see below). Walking up to the shrine on the main road then coming back down on Komachi Street is a good idea. 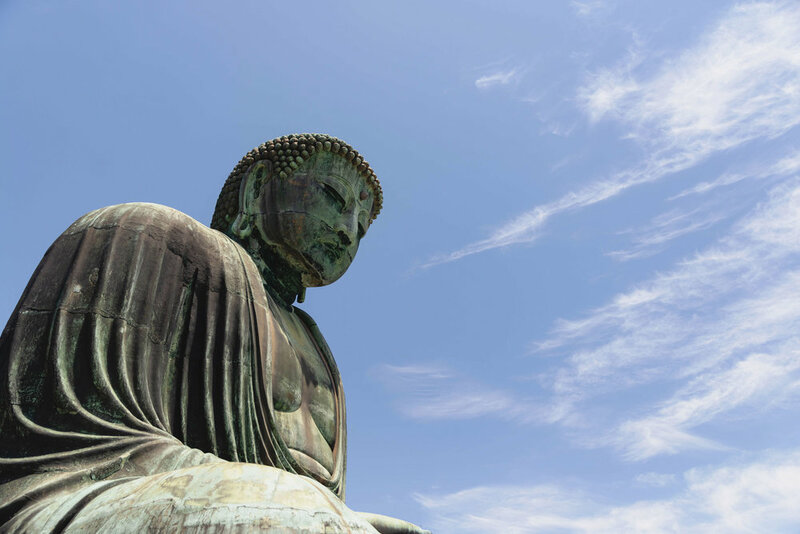 Kamakura’s other main attraction is the Kamakura Daibutsu, or the Great Buddha of Kamakura statue. It’s actually a part of the Buddhist Kotoku-in Temple. The statue is a short walk from Hase station which is on the Enoden line. Shops for tourists seem to slowly be popping up along the route to the temple, but its still quite a residential area. The statue itself is hard to miss and sits in the center of a courtyard next to the actual temple. The temple doesn’t stand out, so my guess is that most people are like me and only visit the statue without ever actually going into the temple itself. Also near Hase station is Hase-dera, another Buddhist temple that dates back to the 8th century. It’s pretty convenient since it’s just a few blocks in from the main road that connects Hase Station and the Great Buddha. There’s quite a bit to explore too. Its located on a hillside on quite a big area with several buildings, gardens and a museum. There’s also places to shop and eat that have ocean views. While the Enoden train goes to the main places in Kamakura, it can get really crowded. It’s a local neighborhood at its core and I don’t think they imagined that thousands of tourists would flood their local streets every day. Walking the local area instead of heading back on the train each time is a good idea. There are a lot of small cafes and boutiques popping up here and there to stumble on. I’ve also been lucky to find some good places to eat. Matsubara-an popped up as a good lunch option as it was highly rated and within walking distance from Hase station (it’s closest to Yuigahama station). It’s a soba noodle shop that looks like a converted old Japanese house, making for a great atmosphere. It can get pretty crowded though - we waited between 30-60 minutes for a late lunch. The food is really good - I recommend their sudachi soba, a Japanese citrus soba. Their tempura is also really light and tasty. Best matcha ice cream? It’s definitely up there. I walked in Kamakura Cha Cha while walking down Komachi street after visiting Tsurugaoka Hachiman-gū shrine, and I’m glad I did. It’s a small shop with several types of creamy, rich, matcha ice cream, each with a different level of matcha intensity. It starts at level 1 (light) and goes up to Level 4 and tops out at Level MAX. There’s also hōjicha, a roasted green tea flavor as well. If you’re like me and like dense matcha flavor, go for the level 4 or MAX. Good quality chirashi sushi. Kohana Sushi is a small, hole-in-the-wall along a road that connects the Hase station area with the Kamakura station area. This is a good road to walk. It’s an older shop with an exterior that blends in with the vintage look of the original neighborhood, the type where most people walking by would probably pay no mind. Inside is a traditional eatery with a bar counter and tables on a tatami mat where you sit on the floor to eat. They’re known for their chirashi sushi which comes in a pair of stacked bowls with the rice on the bottom and an assortment of different kinds of sashimi on the top.